Marriage and Fishing Shirt [marriageandfishing] - $12.00 : Tightwad Tees , Screen printing, embroidery, and design services with no minimums and unbelievable pricing!! Many garment and color options available with image and lettering on front that says, "Practice Catch and Release A marriage license should be like a fishing license. It should expire every year and if you decide to go out of state, you should be able to buy a three-day permit." Ah yes ... the three day permit. What I wouldn't have given for a three day permit during any one of my marriages. I think I may have said too much. 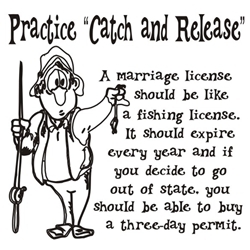 Buy a Marriage and Fishing Shirt ... or at least a three-day permit.